Today, I'm excited to share the outfit I styled as part of a collaboration with Chictopia and Victoria's Secret PINK! They sent me their Slouchy Crew in purple, and I styled the look in a fun and flirty direction to match the spirit of PINK. I wanted to keep the color palette light too so I could edit the photos in a dreamy and angelic style. I paired the sweatshirt with my white flower crown and vintage petticoat, as well as these pale yellow shoes by Colin Stuart, also purchased from Victoria's Secret coincidentally! I really like the interior of this sweatshirt because it's a soft terry cloth and I love the feel of towels!! The whimsical font they used and the pastel lavender shade makes this top much more playful and fashionable than the typical black, dark grey or navy blue sweatshirts. 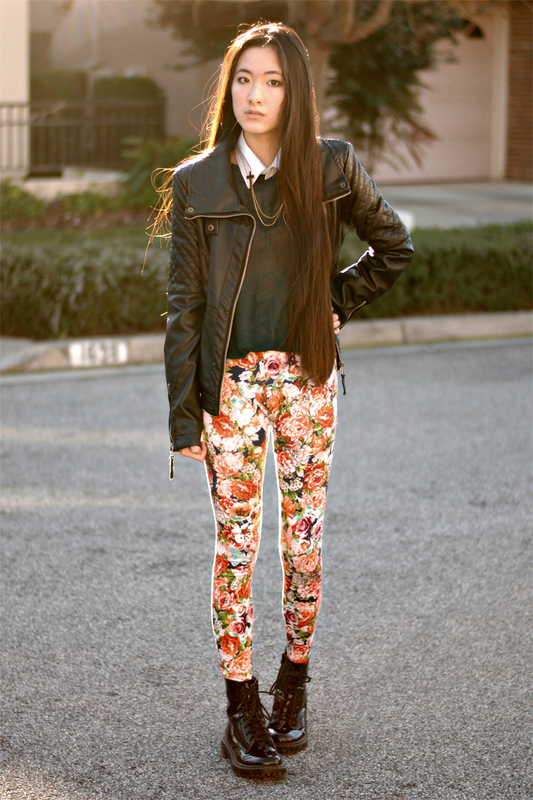 Be sure to check out my look on Chictopia here too! Hi guys! This week, I am starting a new giveaway with aSociete, for the three pieces below, all which were part of my selections for the lookbook we shot! My favorite item has to be the baroque leggings :) I don't know what convinced me to think of pairing these two prints together but once I tried it on, I thought they actually matched in a weird way! This must be the first time I've ever posted an outfit NOT from the street in front of my house! This is one of my favorite looks from the Asociete photoshoot that I did a month ago :) We shot these photos in a beautiful church garden downtown. I love the way the stone fountain in the back compliments the outfit. I originally just envisioned this outfit as a simple all-white look but once the photos were edited, the green and blue hues gave it an aquatic, sea-nymph like touch. 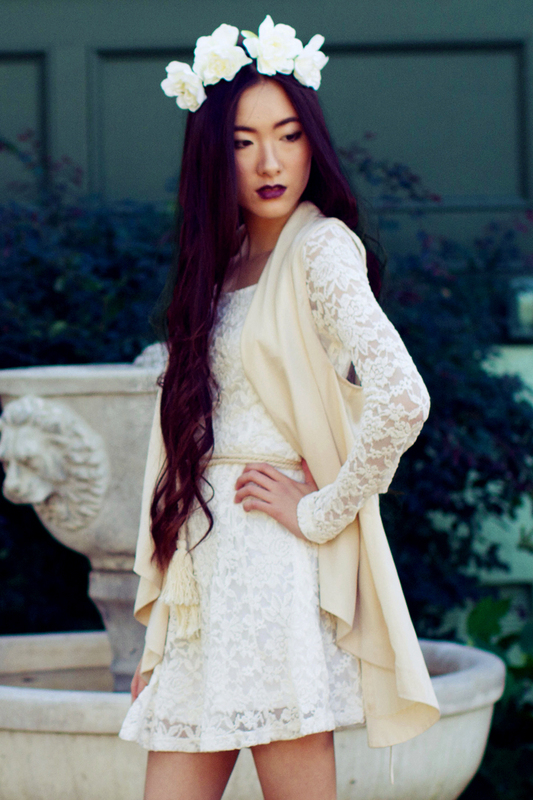 The draped vest is a great piece from Asociete, and right now you can get it for $14! The lace dress is from Awwdore, and as the perfect long-sleeved, white lace dress has evaded my pursuits for a while, I was very happy that they sent me this one! And the funny story about this belt is that it's actually one of those ties you use to hold back your curtains... I got it for $1 when I was in LA last year from a small fabric shop in the Fashion District. I just thought it looked cool at the time so I bought it, but it works perfectly as a tassel belt! 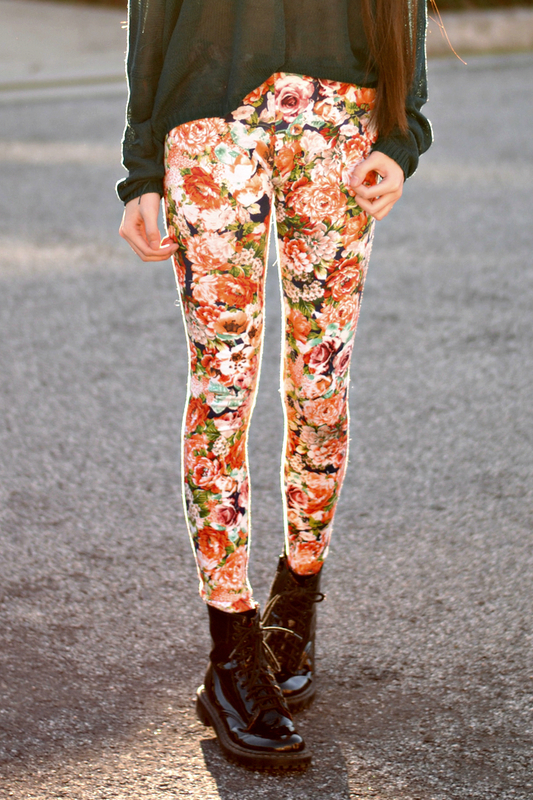 These floral leggings only make me wish for spring to come sooner! If I did get to go to school in New York, I would probably never leave my dorm room for fear of the cold weather. I decided to style these leggings from 2020AVE with this pine-green sweater to compliment the botanical print, and for some pizzazz, I accessorized with these cross collar tips from Romwe. I'd have turned blue without this leather jacket or these combat boots though! Also check out the Romwe "Winter's Final Offer" flash sale starting January 16th - 18th where you can get up to 70% off on the sale items! I noticed they have that black skater skirt I wear in a lot of my looks, in the sale, so if you want one for yourself, do take a look! The last time I've ever gone over a week without posting an outfit to my blog was back in April of 2012 I believe! It feels like I've been gone forever! ;-; You can probably infer that I've had to put my blog on hold because of college apps (I mean that's pretty much all I talk about these days haha), but I'm finally almost done! I'm on my last fine arts portfolio piece and then I only have my FIT illustrations left to finish. Well at least until National Portfolio Day this coming Saturday, and then I might choose to do some more last-minute pieces based on my critiques, but for now I can still rejoice! :) If anyone else is going you might see me and my friends there! 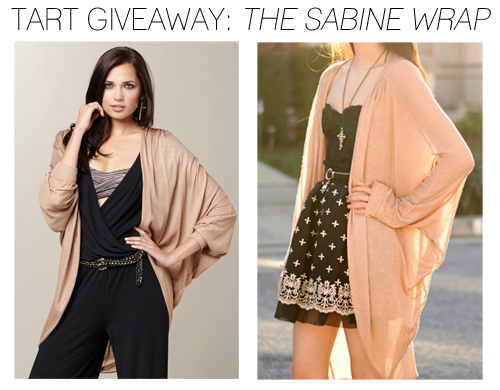 Anyways, I'm happy to start off my first giveaway of the year, thanks to Tart, who has kindly offered to giveaway the same champagne-colored Sabine Wrap that I am wearing, to one of my readers! This giveaway will be open for 10 days and will end next Wednesday, January 23rd. About a month ago, as you may remember, the Asociete team came down to the Bay Area and I got to do a photoshoot with them for their next Feature Influencer lookbook! Their last Feature Influencer was actually my friend, Kendall, from Galore, Beneath the Stars, and their next one is going to be Ashlei, from Faltering Bird; the funny thing is that they didn't know we were all friends until afterwards! 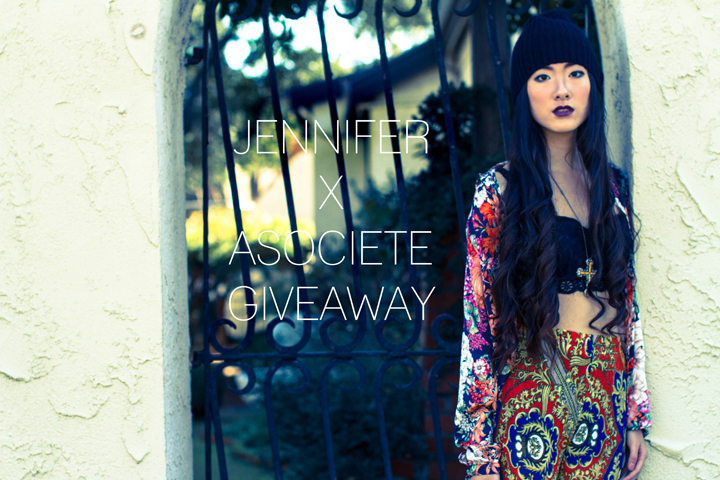 If you haven't heard of Asociete before, they are a brand targeted the towards the young adult and they sell clothing for both guys and girls. Some of my favorite brands that they carry in the women's section include See You Monday and BB Dakota. They know that college students especially, don't always have a lot of money on them at one given time so they developed something called the Flex Pay option where you can checkout now and pay only half, and then pay the other half 30 days later. Unlike layaway, you get your order right away so this is rather handy if you are also working a job aside from school and are waiting for your paycheck to arrive! ;) Their clothes are already pretty affordable so regardless of Flex Pay, you can definitely find something you like that fits in your budget. Below is a photo of me with the entire team! We met up at a local diner downtown to have breakfast together, and then began our shoot which lasted for about 8 hours. We shot a total of 8 looks in 3 different locations so there was a lot of running back and forth to change outfits and do touchups on hair and makeup but I really enjoyed working with all of them and am very happy for the experience! From left to right is Levi, our photographer; Lany, the head of women's operations; David, our videographer; and Liz, the women's fashion director. 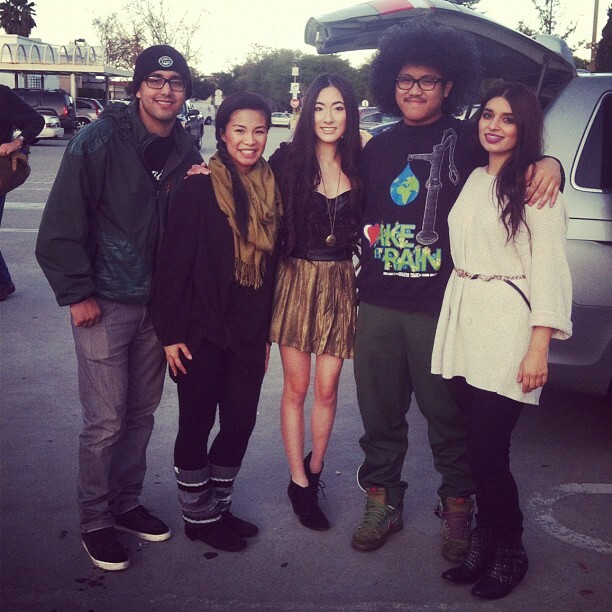 They are all very down to earth and I felt really comfortable around them even though I had just met them! Be sure to check out my lookbook and see my personal picks! 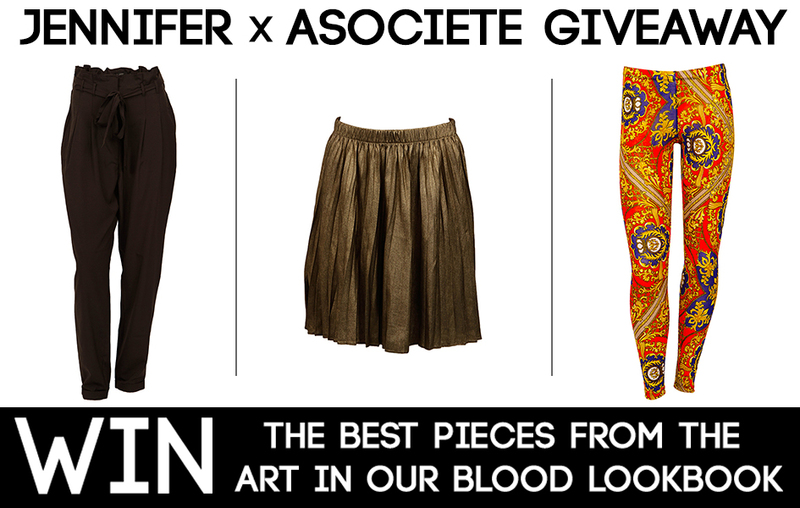 You can also use the coupon code: artinblood for 15% off your purchase at Asociete. This greaser-inspired outfit makes me feel very cool... and also chilly when I took these photos! :P I have to explain that I don't actually leave the house like this without a coat or sweater, but I usually prefer to take off my outerwear to show off the more important parts of my outfit better. Then again, what's considered cold here in California may not actually be that bad, compared to other places! I think I've also said before that I'm usually just stubborn and decide to just deal with being cold. Having an outfit I like on often makes me forget about the chilly weather though! When you're not a morning person, sometimes all you really need to boost your mood at the start of the day is an outfit that you've been dying to show off! I don't wear ponytails often, although I do find them to be very practical since my hair tangles really easily. But because my hair is rather heavy, and I always end up with a sore scalp after having it up for only a few hours :( It's fun wearing one every now and then though! This was the last piece I picked from Sugarlips to style for their Naughty and Nice Contest. Thanks to Sugarlips for letting me represent them in the contest! I'm also excited to see the winning entries :) Hope you all had a chance to enter! PS: I'm happy to say that I finally submitted my first college application tonight, which was to Pratt! I can always look to Siren London for jewelry that gives me wings! ;) I have to say that this is one of the most unique pieces of jewelry I've ever come across! I thought this outfit was perfect as my third look for Chictopia's Naughty or Nice contest, since it was so angelic, literally! This bustier, which was also one of the things I got for Christmas from my wishlist, arrived this week from Nasty Gal and I'm really pleased with the construction and fit. 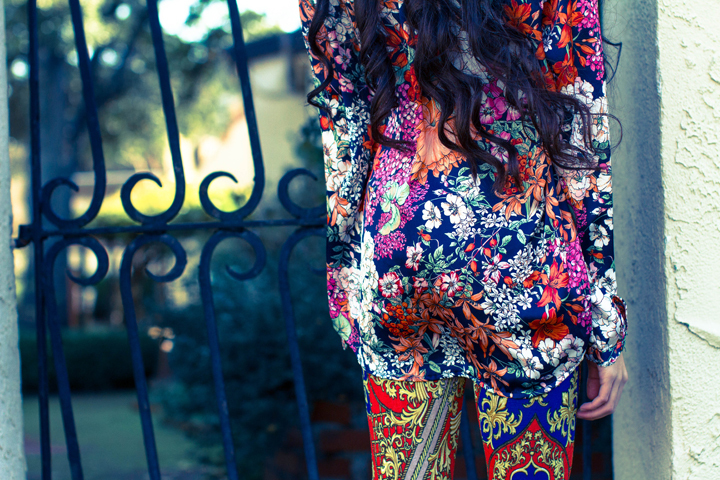 It matched perfectly with these lovely pants from Sugarlips, which by the way are on sale right now for only $13! There's a skirt thing that goes over the pants, which I've never seen on other pants before, but I think it looks pretty cute on this pair. Hope everyone is having a good week! :) It sure is nice being able to photograph a lot of outfit posts during break! I've never experimented too much with the Aztec trend but after I saw my friend, Ashlei, from Faltering Bird, wear this rad cardigan, I really wanted one for myself! 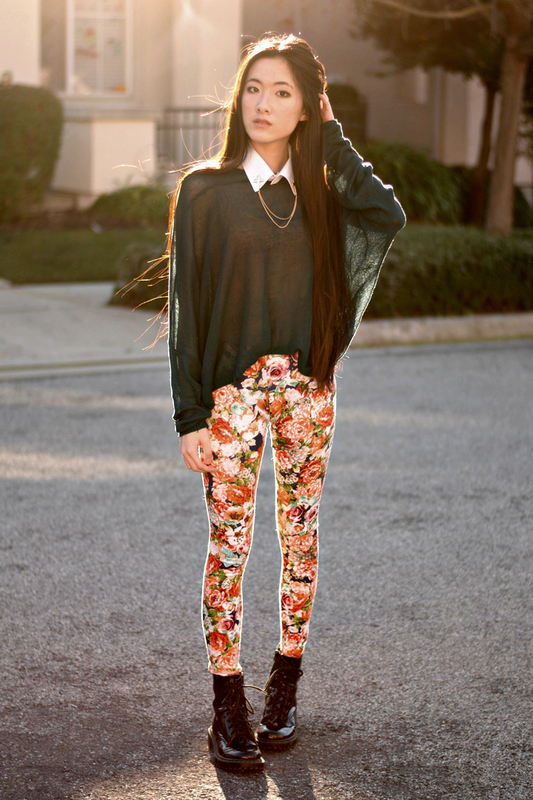 (Definitely check out her blog, I'm always inspired by her style!) The interior of this cardigan is super soft and it's the perfect thickness. The gold and black accents in this cardigan made it super easy to put together the rest of this look. 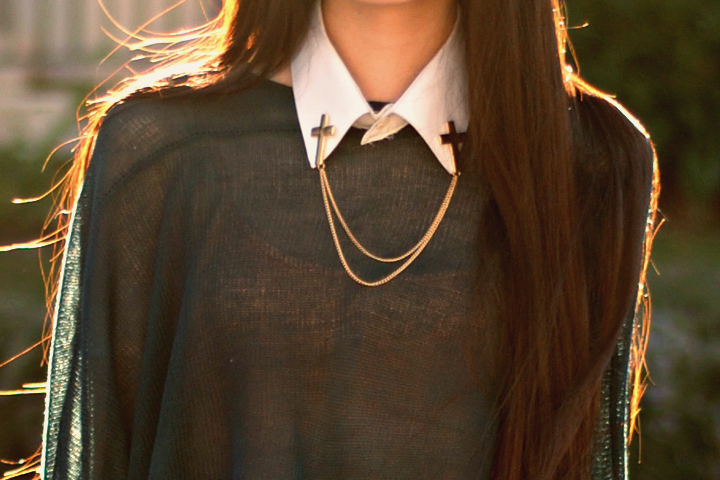 I paired it with this cream blouse from Sugarlips, that also has gold collar tips to match, and this gold cross necklace I recently ordered from eBay. I kept the rest of the look simple, with black pants and black shoes so as not to distract from the top half of the outfit. And I am wearing my favorite flower crown again--the white goes with everything! By the way, this was my second look specifically for Chictopia's Naughty or Nice contest so be sure to enter if you haven't already! DCER, a company that makes temporary tattoos, sent me some to try out! I've forgotten how FUN TEMPORARY TATTOOS ARE! 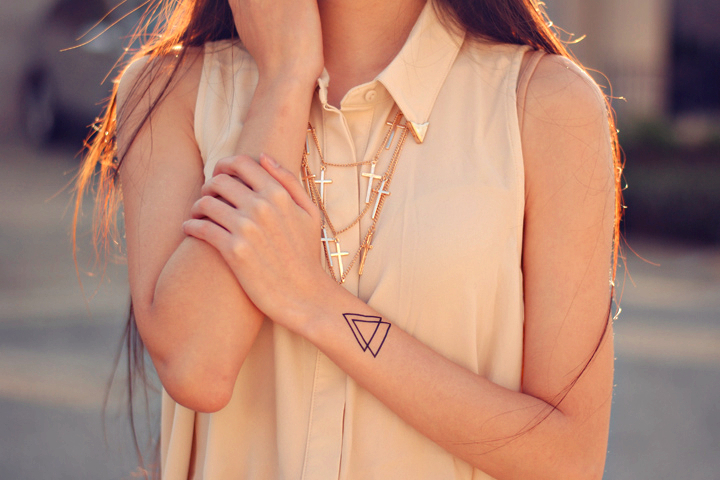 You wouldn't think that two triangles could brighten up your day so much! :P The tattoos come in packs of two and there's lots of other designs you can choose from like feathers, footprints, crosses, and skulls. 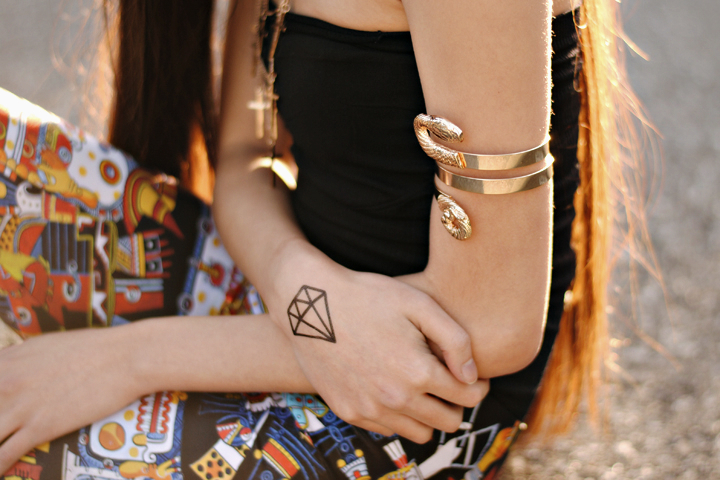 They also sent me a set of diamond tattoos, so I'll be wearing those in an upcoming look! And Happy New Years guys! <3 Thank you to each one of you for your continued support of my blog and I hope that in 2013, I can keep improving my blog :) My inbox is always open if you have questions, or suggestions for types of posts you think I should do!